Google has built it's fair share of web and Android applications. But why Google introduced Allo in September 2016 confuses me. In fact, Google keeps creating new applications that work with other similar Google applications. And everytime this happens, more and more of the people I switch to other applications. Before I give my opinions, let's cover the bit of history. To recap, at first, there was Google Chat (built-in to Gmail). Then they introduced Google Hangout that eventually replaced Google Chat. Google originally had Google Chat, their original chat feature built into Gmail. All it did was basic over the internet chat, similar to and competing with the wildly popular AOL Instant Messenger. And at the time, Google Chat was popular. Everyone was using it because this was the time when GMail became popular. The slow transition from Google Chat to Google Hangout was an opt-in process from the start. Therefore, both systems were running together side-by-side. Messages could also be exchanged between the platforms, since everyone was simply a Google user. However, I found myself initiating fewer chats primarily because Google Hangout's lacked the feature to display if your friend is online or not. If I didn't know who was online, I didn't know who I could contact. Around time of the transition, I believe Facebook Messenger began gaining in popularity, but I never made the move to that chat platform. Eventually, Google Hangouts completely replaced Google Chat. Despite lacking a simple feature of not displaying status, Google Hangouts did add some important feature such as video chat, smartphone integration, and text messaging. Why these features couldn't have been added into Google Chat is something we'll never know. Thankfully, the friend's status was semi brought back, but the status feels delayed and certainly isn't real time. Video chat was a nice to have feature and I've definitely used it. It worked very well and I never recall having any hiccups. The only thing I noticed was most of the people who I video chatted with only logged on to video chat. And it was always pre-planned. It was never a spur of the moment thing for us to video chat. Smartphone integration was also huge. Now, I could respond to messages from both my computer or my smartphone if I were away from keyboard (AFK). This is a huge tie into the Google ecosystem of applications. Lastly, Google and Sprint and a partnership where I could integrate my Sprint number in with Google Voice (which integrated with Google Hangouts) to allow me to send text messages right from Gmail. Additionally, Google Hangout's Android App played a double role of both instant messenger and text messenger. The integration was amazing! Google's Messenger Landscape in 2016 & 2017. In 2017, Google introduced Google Allo and Google Duo. Again, nobody understands why the features of these applications weren't integrated in with Google Hangouts. 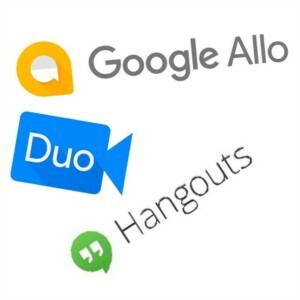 To make matter worse, neither Google Allo, Google Duo, or Google Hangouts can NOT exchange messages between platforms, despite all being Google users. I tried Google Allo and Google Duo when they were released around September of 2016. I really didn't understand the target audience for having all three apps, especially since the core of Google Allo and Google Duo simply replicate functionality that already exists in Google Hangout. Google Duo is purely a video chatting application that only allows video chatting with one person, but allows a "knock" feature that I immediately disabled. I'm not even sure that Google Duo works with a computer's webcam! Google Allo is "smart" and attempts to come up for a reply. But that got old quickly and felt a bit gimmicky after a friend and I were just clicking on the Google Assistant provided responses. Google Allo has text message functionality, but for some unknown reason send text messages thru a 5 digit code instead of my phone number? Therefore useless as a text messaging service. In less than a week, I decided both Google Allo and Google Duo were unnecessary and deleted them. The last thing I need are competing Google applications that cause more battery drain. In 2017, I tried both Google Allo and Google Duo again. Google Duo was still completely useless, literally nothing more to say there. This time around for Google Duo, I found a cool feature that allows me to continue a Duo conversation on a computer browser via a nifty QR code that I scan. I've read that the messages sent from the computer all still route through my smartphone, so if my smartphone is out of batteries or off for any reason, the messages won't get sent. Fine by me. The main problem now is I don't know anybody who is on Duo, because it also doesn't show online status and it still lacks text messaging support. So for now, I'll keep Duo on my smartphone and follow for any updates to features. I should also say that despite not signing up for other chat service, I have signed up for both Line and WeChat. These are international competitors to the chat space that now open the arena up to both people in Taiwan and China. Which brings up the problem with Google products which are all banned in China. I'm not a lawyer, but this seems anti-competitive, as China's equivalent chat applications work in the US. As of now, text messaging is still my primary form. I really do wish Google created an application with better integration with text messages and the computer, similar to iOS. And for Google to consolidate to ONE application that shows status, allows video chatting, and can continue conversations on a computer.